Bathymetry of the Hawaiian – Emperor seamount chain, showing the long volcanic chain generated by the Hawaii hotspot, starting in Hawaiʻi and ending at the Aleutian Trench. The Hawaii hotspot is a volcanic hotspot located near the namesake Hawaiian Islands, in the northern Pacific Ocean. One of the most well-known and heavily studied hotspots in the world,   the Hawaii plume is responsible for the creation of the Hawaiian – Emperor seamount chain, a chain of volcanoes over 5,800 kilometres (3,600 mi) long. Four of these volcanoes are active, two are dormant, and more than 123 are extinct, many having since been ground beneath the waves by erosion as seamounts and atolls. The chain extends from south of the island of Hawaiʻi to the edge of the Aleutian Trench, near the eastern edge of Russia. While most volcanoes are created by geological activity at tectonic plate boundaries, the Hawaii hotspot is located far from plate boundaries. 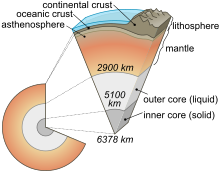 The classic hotspot theory, first proposed in 1963 by John Tuzo Wilson, proposes that a single, fixed mantle plume builds volcanoes that then, cut off from their source by the movement of the Pacific Plate, become increasingly inactive and eventually erode below sea level over millions of years. According to this theory, the nearly 60° bend where the Emperor and Hawaiian segments of the chain meet was caused by a sudden shift in the movement of the Pacific Plate. In 2003, fresh investigations of this irregularity led to the proposal of a mobile hotspot theory, suggesting that hotspots are mobile, not fixed, and that the 47-million-year-old bend was caused by a shift in the hotspot's motion rather than the plate's. Ancient Hawaiians were the first to recognize the increasing age and weathered state of the volcanoes to the north as they progressed on fishing expeditions along the islands. The volatile state of the Hawaiian volcanoes and their constant battle with the sea was a major element in Hawaiian mythology, embodied in Pele, the deity of volcanoes. After the arrival of Europeans on the island, in 1880–1881 James Dwight Dana directed the first formal geological study of the hotspot's volcanics, confirming the relationship long observed by the natives. The Hawaiian Volcano Observatory was founded in 1912 by volcanologist Thomas Jaggar, initiating continuous scientific observation of the islands. 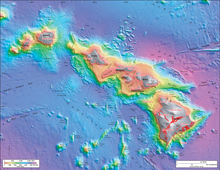 In the 1970s, a mapping project was initiated to gain more information about the complex geology of Hawaii's seafloor. The hotspot has since been tomographically imaged, showing it to be 500 to 600 km (310 to 370 mi) wide and up to 2,000 km (1,200 mi) deep, and olivine and garnet-based studies have shown its magma chamber is approximately 1,500 °C (2,730 °F). In its at least 85 million years of activity the hotspot has produced an estimated 750,000 km3 (180,000 cu mi) of rock. The chain's rate of drift has slowly increased over time, causing the amount of time each individual volcano is active to decrease, from 18 million years for the 76-million-year-old Detroit Seamount, to just under 900,000 for the one-million-year-old Kohala; on the other hand, eruptive volume has increased from 0.01 km3 (0.002 cu mi) per year to about 0.21 km3 (0.050 cu mi). Overall, this has caused a trend towards more active but quickly-silenced, closely spaced volcanoes—whereas volcanoes on the near side of the hotspot overlap each other (forming such superstructures as Hawaiʻi island and the ancient Maui Nui), the oldest of the Emperor seamounts are spaced as far as 200 km (120 mi) apart. Map, color-coded from red to blue to indicate the age of crust built by seafloor spreading. 2 indicates the position of the bend in the hotspot trail, and 3 points to the present location of the Hawaii hotspot. The possibility that the Hawaiian islands became older as one moved to the northwest was suspected by ancient Hawaiians long before Europeans arrived. During their voyages, seafaring Hawaiians noticed differences in erosion, soil formation, and vegetation, allowing them to deduce that the islands to the northwest ( Niʻihau and Kauaʻi) were older than those to the southeast (Maui and Hawaii). The idea was handed down the generations through the legend of Pele, the fiery Hawaiian Goddess of Volcanoes. The Loa and Kea volcanic trends follow meandering parallel paths for thousands of miles. The surface heat flow anomaly around the Hawaiian Swell is only of the order of 10 mW/m2,   far less than the continental United States range of 25 to 150 mW/m2. This is unexpected for the classic model of a hot, buoyant plume in the mantle. However, it has been shown that other plumes display highly variable surface heat fluxes and that this variability may be due to variable hydrothermal fluid flow in the Earth's crust above the hotspots. This fluid flow advectively removes heat from the crust, and the measured conductive heat flow is therefore lower than the true total surface heat flux. The low heat across the Hawaiian Swell indicates that it is not supported by a buoyant crust or upper lithosphere, but is rather propped up by the upwelling hot (and therefore less-dense) mantle plume that causes the surface to rise  through a mechanism known as " dynamic topography". A lava fountain at Pu'u 'O'o, a volcanic cone on the flank of Kilauea. Pu'u 'O'o is one of the most active volcanoes in the world, and has been continuously erupting since January 3, 1983. After the subaerial phase the volcano enters a series of postshield stages involving subsidence and erosion, becoming an atoll and eventually a seamount. Once the Pacific Plate moves it out of the 20 °C (68 °F) tropics, the reef mostly dies away, and the extinct volcano becomes one of an estimated 10,000 barren seamounts worldwide. Every Emperor seamount is a dead volcano. ^ a b c d e f g W. J. Kious; R. I. Tilling (1999) . This Dynamic Earth: the Story of Plate Tectonics (1.14 ed.). United States Geological Survey. ISBN 978-0-16-048220-5. Retrieved 29 June 2009. ^ H. Altonn (31 May 2000). "Scientists dig for clues to volcano's origins: Lava evidence suggests Koolau volcano formed differently from others in the island chain". Honolulu Star-Bulletin. University of Hawaii— School of Ocean and Earth Science and Technology. pp. B03407. Retrieved 21 June 2009. ^ J. T. Wilson (1963). "A possible origin of the Hawaiian Islands". Canadian Journal of Physics. 41 (6): 863–870. Bibcode: 1963CaJPh..41..863W. doi: 10.1139/p63-094. ^ G. D. Garland (1995). "John Tuzo Wilson: 24 October 1908-15 April 1993". Biographical Memoirs of Fellows of the Royal Society. 41: 534–552. doi: 10.1098/rsbm.1995.0032. ^ a b W. J. Kious; R. I. Tilling (1999) . "This Dynamic Earth: The long trail of the Hawaiian hotspot". Retrieved 29 February 2012. ^ J. M. Whittaker; et al. (5 October 2007). "Major Australian-Antarctic Plate Reorganization at Hawaiian – Emperor Bend Time". Science. 318 (5847): 83–86. Bibcode: 2007Sci...318...83W. doi: 10.1126/science.1143769. ISSN 0036-8075. PMID 17916729. ^ a b c Tarduno; et al. (2003). "The Emperor Seamounts: Southward Motion of the Hawaiian Hotspot Plume in Earth's Mantle" (PDF). Science. 301 (5636): 1064–1069. Bibcode: 2003Sci...301.1064T. doi: 10.1126/science.1086442. PMID 12881572. ^ a b D. L. Turcotte; G. Schubert (2001). "1". Geodynamics (2 ed.). Cambridge University Press. pp. 17, 324. ISBN 978-0-521-66624-4. ^ "Heat is deep and magma is shallow in a hot-spot system". Hawaii Volcano Observatory— United States Geological Survey. 18 June 2001. Retrieved 29 March 2009. ^ V. Clouard; A. Bonneville (2005). Ages of seamounts, islands, and plateaus on the Pacific plate. Geological Society of America Special Papers. 388. Geological Society of America. pp. 71–90. doi: 10.1130/0-8137-2388-4.71. ISBN 978-0-8137-2388-4. ^ W. J. Morgan; J. P. Morgan. "Plate velocities in hotspot reference frame: electronic supplement" (PDF). Retrieved 23 April 2010. ^ R. Keller (9 April 2009). "Seamounts in the Eastern Gulf of Alaska: A Volcanic Hotspot with a Twist?". National Oceanic and Atmospheric Administration. Retrieved 6 June 2009. ^ C. Doglioni; M. Cuffaro (1 October 2005). "The hotspot reference frame and the westward drift of the lithosphere". Retrieved 7 June 2009. ^ D. DePaolo; M. Manga (9 May 2003). "Deep Origin of Hotspots—the Mantle Plume Model" (PDF). Retrieved 6 June 2009. ^ A. D. Smith (April 2003). "A Reappraisal of Stress Field and Convective Roll Models for the Origin and Distribution of Cretaceous to Recent Intraplate Volcanism in the Pacific Basin". International Geology Review. 45 (4): 287–302. Bibcode: 2003IGRv...45..287S. doi: 10.2747/0020-6814.45.4.287. ISSN 0020-6814. ^ I. O. Norton (24 January 2006). "Speculations on tectonic origin of the Hawaii hotspot". Retrieved 30 May 2009. ^ G.R. Foulger; et al. (2013). "Caveats on Tomographic Images" (PDF). Terra Nova. 25 (4): 259–281. Bibcode: 2013TeNov..25..259F. doi: 10.1111/ter.12041. ^ a b c d M. O. Garcia; et al. (16 May 2006). "Geology, geochemistry and earthquake history of Lōʻihi Seamount, Hawaii". Chemie der Erde - Geochemistry. 66 (2): 81–108. Bibcode: 2006ChEG...66...81G. doi: 10.1016/j.chemer.2005.09.002. hdl: 1912/1102. Retrieved 26 February 2012. ^ a b H. Rance (1999). Historical Geology: The Present is the Key to the Past (PDF). QCC Press. pp. 405–407. Retrieved 29 June 2009. ^ a b C. Uhlik (8 January 2003). "The 'fixed' hotspot that formed Hawaii may not be stationary, scientists conclude". Stanford Report. Stanford University. Retrieved 3 April 2009. ^ a b c d B. C. Kerr; D. W. Scholl; S. L. Klemperer (12 July 2005). "Seismic stratigraphy of Detroit Seamount, Hawaiian Emperor seamount chain: Post-hot-spot shield-building volcanism and deposition of the Meiji drift" (PDF). Geochemistry, Geophysics, Geosystems. 6 (7): n/a. Bibcode: 2005GGG.....6.7L10K. doi: 10.1029/2004GC000705. Retrieved 25 February 2012. ^ a b c J. Roach (14 August 2003). "Hot Spot That Spawned Hawaii Was on the Move, Study Finds". National Geographic News. Retrieved 9 March 2009. ^ a b c d e f G. R. Foulger; D. L. Anderson. "The Emperor and Hawaiian Volcanic Chains: How well do they fit the plume hypothesis?". Retrieved 1 April 2009. ^ a b W. D. Westervelt (2008) . Hawaiian Legends of Volcanoes. Easy Reading Series. Forgotten Books. ISBN 978-1-60506-963-0. Retrieved 30 June 2009. ^ S. Hune; G. M. Nomura (2003). Asian/Pacific Islander American women. NYU Press. p. 26. ISBN 978-0-8147-3633-3. Retrieved 30 June 2009. ^ A. Menzies (1920). W. F. Wilson (ed.). Hawaii Nei 128 Years Ago: Journal of Archibald Menzies, kept during his three visits to the Sandwich or Hawaiian Islands in the years 1792–1799. s.n. p. 197. Retrieved 1 December 2009. ^ J. Macrae (1922). W. F. Wilson (ed.). With Lord Byron at the Sandwich Islands in 1825: Being Extracts from the MS Diary of James Macrae, Scottish Botanist. s.n. ISBN 978-0-554-60526-5. Retrieved 11 December 2009. ^ R. A. Sprague (1991). "Measuring the Mountain: the United States Exploring Expedition on Mauna Loa, 1840–1841". Hawaiian Journal of History. 25. hdl: 10524/359. ^ E. A. Kay (1997). "Missionary Contributions to Hawaiian Natural History: What Darwin Didn't Know". Hawaiian Journal of History. 31: 27–51. hdl: 10524/170. ^ J. D. Dana (1852). "Note on the eruption of Mauna Loa". American Journal of Science. 100: 254–257. ^ a b Robert W. Decker; Thomas L. Wright; Peter H. Stauffer, eds. (1987). Volcanism in Hawaii: papers to commemorate the 75th anniversary of the founding of the Hawaii Volcano Observatory. 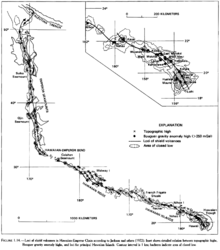 United States Geological Survey Professional Paper, 1350. 1. United States Geological Survey. ^ R. A. Apple (4 January 2005). "Thomas A. Jaggar, Jr., and the Hawaiian Volcano Observatory". Hawaiian Volcano Observatory— United States Geological Survey. Retrieved 26 February 2012. ^ R. J. Van Wyckhouse (1973). "Synthetic Bathymetric Profiling System (SYNBAPS)". Defense Technical Information Center. Retrieved 25 October 2009. ^ a b c P. Wessel (1993). "Observational Constraints on Models of the Hawaiian Hot Spot Swell". Journal of Geophysical Research. 98 (B9): 16, 095–16, 104. Bibcode: 1993JGR....9816095W. doi: 10.1029/93JB01230. ISSN 0148-0227. OCLC 2396688. Archived from the original on 20 October 2000. Retrieved 24 December 2010. ^ a b "MBARI Hawaii Multibeam Survey". Monterey Bay Aquarium Research Institute. 1998. Retrieved 29 March 2009. ^ a b B. W. Eakens; et al. "Hawaii's Volcanoes Revealed" (PDF). United States Geological Survey. Archived from the original (PDF) on 26 October 2004. Retrieved 28 March 2009. ^ Zhao, D (2004). "Global tomographic images of mantle plumes and subducting slabs: insight into deep Earth dynamics". Physics of the Earth and Planetary Interiors. 146 (1–2): 3. Bibcode: 2004PEPI..146....3Z. doi: 10.1016/j.pepi.2003.07.032. ^ Y. Ji; H. Nataf (1998). "Detection of mantle plumes in the lower mantle by diffraction tomography: Hawaii". Earth and Planetary Science Letters. 159 (3–4): 99. Bibcode: 1998E&PSL.159...99J. doi: 10.1016/S0012-821X(98)00060-0. ^ D. Zhao (November 2007). "Seismic images under 60 hotspots: Search for mantle plumes". Gondwana Research. 12 (4): 335–355. Bibcode: 2007GondR..12..335Z. doi: 10.1016/j.gr.2007.03.001. ^ B. Bourdon; et al. (7 December 2006). "Insights into the dynamics of mantle plumes from uranium-series geochemistry". Nature. 444 (7120): 713–717. Bibcode: 2006Natur.444..713B. doi: 10.1038/nature05341. PMID 17151659. ^ T. Sisson. "Temperatures and depths of origin of magmas fueling the Hawaiian volcanic chain". United States Geological Survey. Retrieved 2 April 2009. ^ a b c R. P. Von Herzen; et al. (1989). "Heat Flow and the Thermal Origin of Hot Spot Swells: The Hawaiian Swell Revisited". Journal of Geophysical Research: Solid Earth. 94 (B10): 13, 783–13, 799. Bibcode: 1989JGR....9413783V. doi: 10.1029/jb094ib10p13783. ^ a b Harris, Robert N.; McNutt, Marcia K. (2007). "Heat flow on hot spot swells: Evidence for fluid flow". Journal of Geophysical Research. 112 (B3): B03407. Bibcode: 2007JGRB..11203407H. CiteSeerX 10.1.1.462.6509. doi: 10.1029/2006JB004299. ^ "Heat Flow - A transfer of temperature". Southern Methodist University. Archived from the original on 22 March 2012. Retrieved 24 February 2012. ^ R. F. Butler (1992). Paleomagnetism: Magnetic Domains to Geologic Terranes (PDF). Blackwell Scientific Publications. Archived from the original (PDF) on 21 February 2012. Retrieved 26 February 2012. ^ "Ocean Drilling Program Leg 197 – Scientific Prospectus – Motion of the Hawaiian Hotspot: a Paleomagnetic Test". Ocean Drilling Program. 17 April 2001. Retrieved 11 April 2009. ^ a b "Drilling Strategy". Ocean Drilling Program. Retrieved 4 April 2009. ^ a b c M. Regelous; A. W. Hofmann; W. Abouchami; S. J. G. Galer (2003). "Geochemistry of Lavas from the Emperor Seamounts, and the Geochemical Evolution of Hawaiian Magmatism from 85 to 42 Ma". Journal of Petrology. 44 (1): 113–140. Bibcode: 2003JPet...44..113R. doi: 10.1093/petrology/44.1.113. ^ M.N. Shapiro; A.V. Soloviev; G.V. Ledneva (2006). "Emperor subduction?". Retrieved 1 April 2009. ^ D. O'Meara (2008). Volcano: A Visual Guide. Firefly Books. ISBN 978-1-55407-353-5. ^ "SITE 1206". Ocean Drilling Program Database-Results of Site 1206. Ocean Drilling Program. Retrieved 9 April 2009. ^ a b "Site 1205 Background and Scientific Objectives". Ocean Drilling Program database entry. Ocean Drilling Program. Retrieved 10 April 2009. ^ a b D. A. Clauge and G. B. Dalrymple (1987). "The Hawaiian-Emperor volcanic chain: Part 1. Geologic Evolution". United States Geological Survey Professional Paper 1350. p. 23. ^ "Earthquake Risk Due to Hotspot Volcanoes: The Case of Hawaii". AIR Worldwide. 2013. Retrieved 3 June 2018. 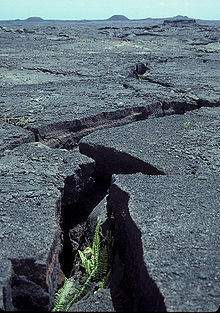 ^ "Destructive Earthquakes in Hawai'i County Since 1868". Hawaiian Volcano Observatory. 2006. Archived from the original on 25 August 2009. Retrieved 3 June 2018. ^ Walter C. Dudley (1998). Tsunami! (second ed.). University of Hawaii Press. pp. 222–24. ISBN 978-0-8248-1969-9. ^ K. Rubin; M. Garcia. "Reply to Ask-An-Earth-Scientist". University of Hawaii. Retrieved 11 May 2009. ^ a b c d e f "Evolution of Hawaiian Volcanoes". Hawaiian Volcano Observatory— United States Geological Survey. 8 September 1995. Retrieved 7 March 2009. ^ "How Volcanoes Work: Shield Volcanoes". San Diego State University. Retrieved 25 January 2012. ^ H. King. "Highest Mountain in the World". Retrieved 4 July 2009. ^ M. O. Garcia; et al. (1996). "Petrology of lavas from the Puu Oo eruption of Kilauea Volcano: III. The Kupaianaha episode (1986–1992)". Bulletin of Volcanology. 58 (5): 359–379. Bibcode: 1996BVol...58..359G. doi: 10.1007/s004450050145. ^ a b J. G. Moore; et al. (1 April 1994). "Giant Hawaiian Underwater Landslides". Science. 264 (5155): 46–47. Bibcode: 1994Sci...264...46M. doi: 10.1126/science.264.5155.46. JSTOR 2883819. PMID 17778132. ^ J. W. Head III, L. Wilson; Wilson (2003). "Deep submarine pyroclastic eruptions: theory and predicted landforms and deposits" (PDF). Journal of Volcanology and Geothermal Research. 121 (3–4): 155–193. Bibcode: 2003JVGR..121..155H. CiteSeerX 10.1.1.555.7644. doi: 10.1016/S0377-0273(02)00425-0. Retrieved 26 February 2012. ^ "Recent Kīlauea Status Reports, Updates, and Information Releases". United States Geological Survey— Hawaiian Volcano Observatory. Retrieved 15 March 2009. ^ "Seamounts". Encyclopædia Britannica. Britannica.com Inc. 1913. Retrieved 15 March 2009. Wikimedia Commons has media related to Hawaii hotspot. Pele-Goddess of Fire—Details Pele's full story, according to Hawaiian myths. The long trail of the Hawaiian hotspot—USGS article on the Hawaiian island chain. Evolution of Hawaiian Volcanoes—USGS article on the evolution of Hawaiian volcanoes over time.